The Bigelow Nolina is a member of the agave family. It has long, stiff, evergreen leaves to 4 1/2 feet in length that grow from a central stem. The leaves have smooth edges, but are pointy at the ends. 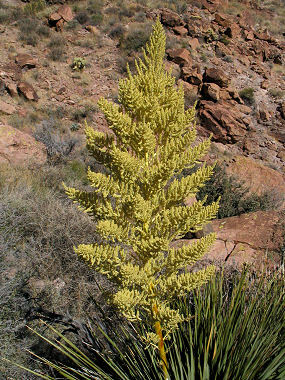 The plant grows on hillsides and in canyons from 500 - 3500 feet in elevation. Native Americans roasted the flower stalk of the Bigelow Nolina for food. 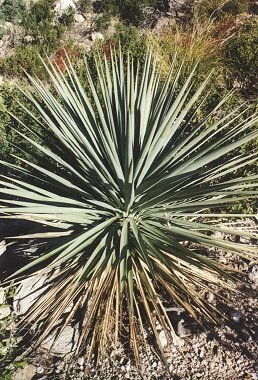 Like other agaves, the plant produces a large flower stalk, which grows to 8 feet in height. The stalk produces clusters of greenish-white flowers between June and July.